Download the Kettle Hills Golf Course mobile app to enhance your experience. Mobile apps contain many features like scorecard, GPS, tee times, news, deals and more! Click on the icons for more information and free download. At Kettle Hills there are 45 holes of championship golf which offer great variety and value. Built in 1987, the Ponds/Woods course has a front nine with water on seven of the nine holes; the back nine is a visual delight through tree lined fairways. The Valley Course has fantastic views of the Kettle Moraine, and while challenging, is a bit more forgiving than the Ponds/Woods. 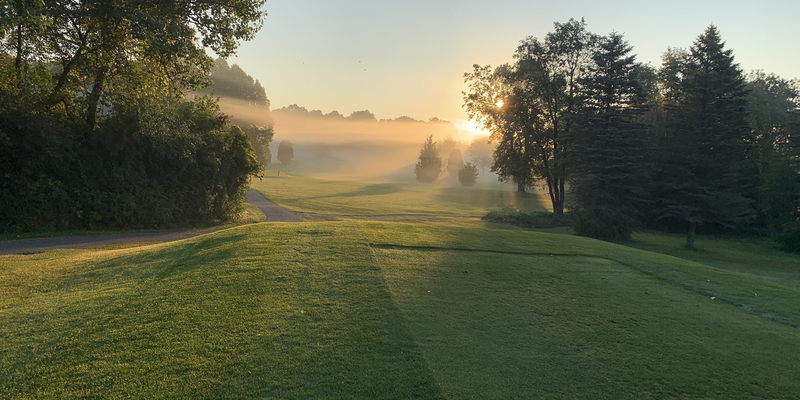 The Rolling Nine is a full length 9 hole course, perfect for small outings or corporate events without the big price tag. A full size driving range, golf professional, many options for lessons and clinics, a teaching and practice hole, and two practice greens are all available to help you improve! The outing facility with private bar and large covered deck is also the perfect place for your next group outing. There is room available for groups of 16-300. Snack cabanas located near the 10th tee on each course provide food and drink during prime playing hours. There are roaming beverage carts on the course daily with snacks, candy, sandwiches and assorted ice cold beverages. The rustic log clubhouse boasts a newly renovated bar and grille with big screen televisions and daily specials. You are sure to enjoy your visit and find the challenge you are looking for at Kettle Hills Golf Course! Please call 262-628-0200 for current rates. Call 262-628-0200 for rates and tee times. Up to 9 days in advance. Please refer to http://www.kettlehills.com/memberships/ for more information regarding Membership Rules and Regulations. Multiple leagues daily; spaces are available. Please contact us at 262-628-0200 or at nickt@kettlehills.com to inquire! Contact Kettle Hills Golf Course at 262-628-0200. Enjoy a drink and sandwich after your round in the newly renovated bar and grille. The menu includes daily sandwich specials, appetizers, wraps, paninis, burgers, soups and pizza. The bar, dining area, and outdoor patio overlook the first and third holes of the Ponds/Woods course. Groups of 16-40 may inquire about special menu options following group outings. Watch the Kettle Hills Golf Course Video. This profile was last updated on 01/14/2019 and has been viewed 59,221 times.